Matthew R. Jennings concentrates his practice in structured finance and securitization matters. He regularly represents various parties in the structured finance market, including issuers, underwriters and lenders in both public and private transactions. 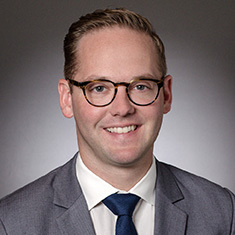 Matt has experience with prime and sub-prime automobile loans and automobile lease securitizations and warehouses, secured warehouse lending facilities, revolving credit facilities and structured term loans. He also has experience with general corporate matters, including representing high-growth companies in raising capital. Matt currently serves as secretary of the Structured Finance Committee of the New York City Bar Association. While in law school, he served as the symposium editor of the Fordham International Law Journal. Prior to law school, Matt taught ninth-grade English and English as a second language through Teach For America.